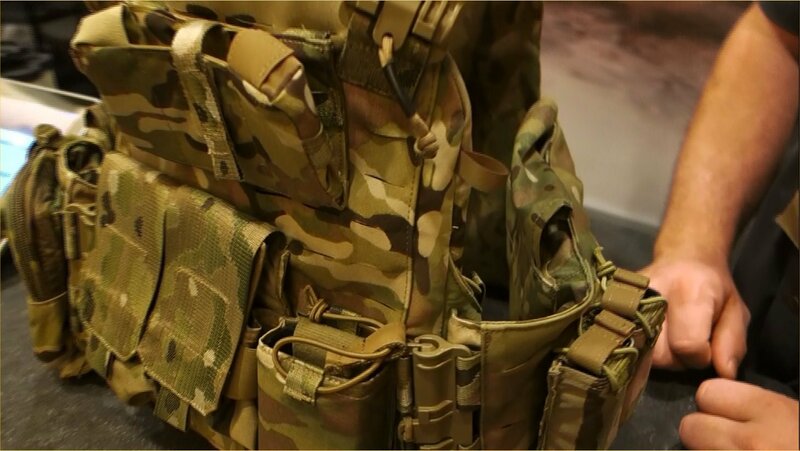 Renegade Armor/FirstSpear Maritime Assault Plate Carrier System and Rifle Magazine Pocket Mag Pouches in Crye MultiCam Camouflage: Lightweight Tactical Body Armor with Floatation Capability (Video!) | DefenseReview.com (DR): An online tactical technology and military defense technology magazine with particular focus on the latest and greatest tactical firearms news (tactical gun news), tactical gear news and tactical shooting news. All photo and first/top video content contained in this article was shot by DefenseReview.com, and is copyrighted. DefenseReview.com owns the copyright on all photo and first/top video content. All DR photos and videos were shot with a Sony Cyber-shot RX100 (DSC-RX100/B) Digital Camera with 20.2 MP (20.2-megapixel) still camera and 1080p HD video camera capability. Renegade Armor/FirstSpear has designed and developed an interesting maritime tactical armor plate carrier called the Maritime Assault Plate Carrier System (MAPCS) using FirstSpear Maritime Technology that would appear to be ideally suited to VBSS (Visit, Board, Search and Seizure), GOPLATS (Gas and Oil PLATformS) and anti-piracy operations, but also useful for any/all Special Operations or general combat operations in and around maritime environments. The Renegade Armor/FirstSpear Maritime Assault Plate Carrier System utilizes trailor board outside, neoprene inside, and a floatation cumberbund. 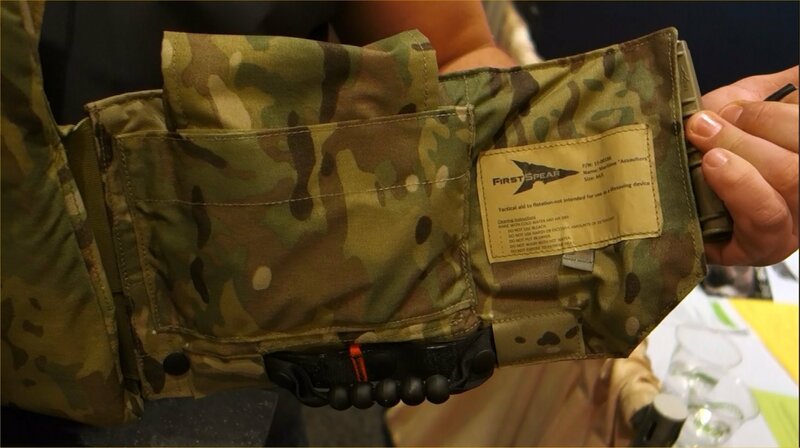 The cumberbund utilizes the FirstSpear Tubes technology fast-attach/quick-detach (QD) system. First Spear showed DR the whole system at SHOT Show 2013. Renegade Armor/First Spear 5.56mm "Rifle Magazine Pocket" mag pouches can be attached to the First Spear 6/12 Pocket Attachment System "non-MOLLE" MOLLE webbing using the new First Spear 6/9 Modular Pocket Technology attachment tab system, essentially the next step in weight cutting technology beyond FirstSpear 6/12 Modular Pocket Technology, in order to cut as much weight was possible. The FirstSpear Rifle Magazine Pockets themselves come in various flavors, including both "speed reload"/"Ranger" format with shock cord and speed tab and the more tradtional large webbing flap. First Spear even has a SureFire Magazine Pocket Triple 6/9 mag pouch designed to hold three SureFire MAG5-60 HCM (High Capacity Magazine) quad-stack (4×2 config) 60-round/shot mags. The FirstSpear Alligator Rapid Access System also looks interesting, since the company claims that it provides fast access to flash-bang, smoke or fragmentation grenades while also providing "high security"/retention. Contains a 500D Nylon backed Plate Carrier with sized Inflatable Floatation Cummerbund, a 2" Belly Band and Buoyancy Compensation Inserts. With highly water-resistant, lightweight materials, adjustment and comfort, this system offers full flexibility and enhanced safety for operations in a Maritime environment. It is sized to fit plates in either the "Swimmer" or ESAPI/SPEAR cuts. Buoyancy Compensation Inserts help maintain a slightly neutral capability while transporting a basic load of equipment. 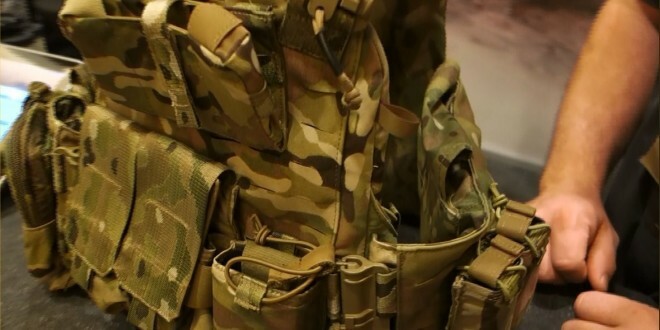 Both wings of the Maritime Assault Plate Carrier's Front Panel have pockets with adjustable tie downs that can hold radios similar to the size and shape of the AN/PRC-148 (MBITR) or AN/PRC-152 (MBHH) and can even be adjusted to fit the 60 Round Surefire M4 Magazine. Utilizing the latest in FirstSpear™ technologies, including the 6/12™ pocket attachment system and TUBES™, this is a state of the art capability designed to support Maritime Assault Operations. FirstSpear™ does not produce or claim to provide PFD’s (personal flotation devices) or life saving devices. We provide the best 'Tactical Aids to Flotation'." FirstSpear™ is in the business of providing innovative solutions to long unanswered challenges. Our Tubes™ technology reaffirms that position. The common closure method for most Armor Carriers on the market today is to join the cummerbund in the front with hook & loop fasteners like Velcro®. This presents many performance failures. The hook & loop adds weight and bulk; is noisy and wears out quickly; and retains water, mud and snow. From a safety standpoint the hook and loop closure flap allows for cummerbund protection accessories like side plates and inflatable floatation to shift position and misalign from where they should be to provide maximum performance. The common release mechanisms found in most releasable vests typically utilize a variety of cables, routed through a complex maze of channels that when assembled correctly, are clumsy, heavy, awkward and difficult to reassemble. When assembled incorrectly, the results can be catastrophic. FirstSpear™ Tubes™ solve all these challenges. Quick to close and even quicker to doff, Tubes™ are manufactured from lightweight high-performance polymers that exceed the strength of other molded fasteners currently used on Operational equipment. Molded in signature suppressive colors and with a variety of choices for activation, this closure system can be rapidly deployed and completely reassembled in SECONDS. Let FirstSpear™ show you how Tubes™ technology will improve performance, enhance mission functionality, reduce weight and allow you to ditch the cable. 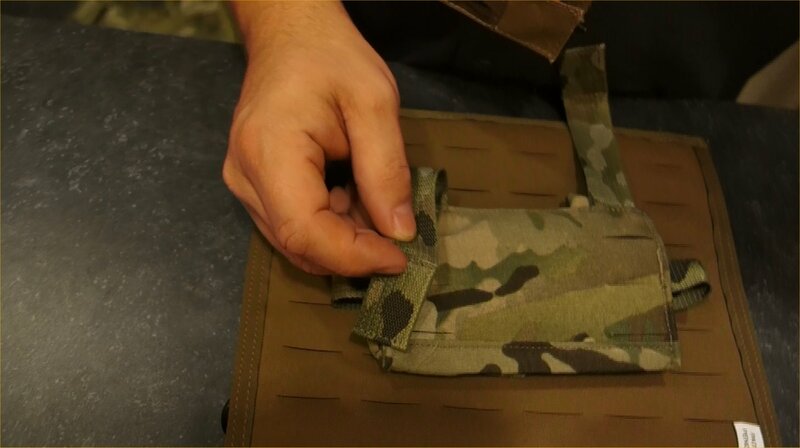 Modular Pockets Compatible with FirstSpear™ 6/12™ Platforms Weight reduction is not just a buzz phrase at FirstSpear™ – it is an ethos demonstrated by the 6/12™ pocket line. Utilizing these pockets on FirstSpear™ 6/12™ platforms allows the wearer to achieve a weight reduction of over 40% without sacrificing performance. By removing the heavy nylon webbing, polymer reinforcement and metal snaps of the previous system, not only is weight reduced, but the overall profile of the pocket on the platform is significantly condensed as well, allowing improved signature management in all visual, IR and thermal spectrums. Hostile Environments involve more than just gunfire. Other factors will directly impact our User’s ability to survive and successfully complete their missions. Among one of the most demanding and challenging an Operator can face is the Maritime Environment. In addition to armed adversaries, drowning & hypothermia can be every bit as much of a threat to personal safety. Fortunately, FirstSpear™ is all about a challenge! Making use of several decades of acquired Operational experience in Maritime Operations, FirstSpear™ has looked at the needs and mission requirements from multiple angles to offer true Maritime integrated capabilities. If your mission is taking you back to or beyond the surf zone, check out FirstSpear™ because we never left it. Immediate access, high security, no bulk, and zero noise. With one swift pull of a gloved, mitted or naked hand, the FS Alligator Rapid Access System gives you immediate access to flash-bang, smoke or fragmentation grenades. The Alligator can be removed and replaced with a 1” surface-mounted side release buckle, giving you one pocket with multiple options for access and security. Since the Alligator is flexible and conformable, you no longer have large, bulky protrusions of your equipment, no plastic to break, and you can remain streamlined for entry into narrow access areas." Previous: MWG IK-520 ’40-Rounder’ 40-Round Steel-Reinforced Polymer AR-15 Rifle Magazine (5.56mm/.223 Rem.) Lookin’ Good: Initial DR Range Report!